Lock in a great price for Healthouse Las Dunas – rated 9.2 by recent guests! Great location! It's located in front of beach and in area of residence. You can have breakfast with ocean view. You can go jogging and walking around alongside beach. Staffs! Staffs were very kind and helpful with big smile. Facilities! Beautiful garden with pool was well maintained. You could enjoy sunbathing in the garden. Gym with ocean view and yoga and Pilates room was great. Enough parking lots. Relaxing, beautiful setting. Nice wine and we all, including the children loved the food. Staff always on hand and very polite. Best hotel ever! I was here with a friend of mine to celebrate our birthdays. This hotel is the description of excellence itself! A palace in a little corner of heaven with the sound of the waves as background melody. The gastronomic restaurant was delicious as per the wine selection. The service was more than perfect. The staff have been so kind and helpful with us. The spa and aquagym were a very nice experience. We had a magic moment and are planning to renew this experience soon. Thank you so much for this out of world moment. The staff were very friendly. They upgraded our room when we arrived. The room was beautiful, very clean and bed was very comfortable. Staff called me when I landed to check that we had arrived safely and to direct us to the hotel. The grounds, beach and pool are wonderful. The pool area is so nice, there are always towels available. The pool showers are working and there are 6 of them. Pool itself is really for adults, you can really swim and enjoy. The beach is just steps away and wonderful waters. It is an open sea, not within a bay. So you need to be aware of that when swimming. If it is windy, stormy, the sea is not protected. As a Mediterranean girl I was OK with it but those who are not familiar with sea and weather, need to pay attention. The rooms are very well kept and beds are comfortable. Bathrooms are clean and every comfort in the room are taken care of. It is really a blissful luxury in the rooms. las dunes health house is beautiful hotel with ever so helpful and kind staff. The location, amidst lush/well kept gardens, by the sea, with birds singing and everything spotless clean and well organised made our stay unforgettable and very relaxed. Both of us were feeling very sad to leave this place behind and we truly miss it till today. The elegance and at the same time cosiness of the rooms well complimented to our wonderful stay at this place. We also appreciated the exquisite food there, delicious and very healthy at the same time. We loved every minute of our holidays in this place !!!! Healthouse Las Dunas This rating is a reflection of how the property compares to the industry standard when it comes to price, facilities and services available. It's based on a self-evaluation by the property. Use this rating to help choose your stay! Healthouse Las Dunas is a luxury health-focused hotel located in Estepona. Set in a traditional Andalusian-style building, this property offers two health and wellness Spa Centers, and various pools. All air-conditioned rooms in this hotel have a modern flat-screen TV with satellite channels, safe, sofa, working area and mini-bar, plus a private balcony with an outdoor sitting area. The private bathroom includes free luxury toiletries, bathrobe and slippers, bath and shower. Set within luxurious gardens and fountains, the property offers medical experts in dieting and nutrition, meeting facilities, and different classes, including Yoga, Pilates, and Aquagym. Free WiFi is available in the entire property. Healthouse Las Dunas offers 2 Wellness and beauty Spas of 320 square yards and 3,000 square yards, guests can enjoy a wide range of treatments focused in weight reduction, relaxation or beauty. Specialized in health and wellness, this hotel offers a balanced and healthy diet and does not serve alcohol or soft drinks, only natural juice, water, tea and coffee. Infusions and alcohol-free cocktails are also provided. Smoking is forbidden throughout the entire property. 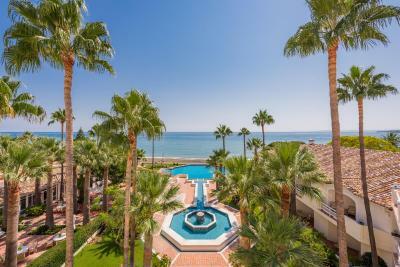 Healthouse Las Dunas is located a 15-minute drive from Puerto Banus, and 43 mi from Malaga Airport. When would you like to stay at Healthouse Las Dunas? Including a Loewe TV, mini-bar with special water menu, and free WiFi, this room features views of the gardens. The bathroom is equipped with high-quality toiletries, hairdryer, bathrobe and slippers. This room has a private balcony with seating area. Including a Loewe TV, mini-bar with special water menu, and free WiFi, this room features views of the sea and the gardens. The bathroom is equipped with high-quality toiletries, hairdryer, bathrobe and slippers. Including 2 Loewe TVs, mini-bar with special water menu, and free WiFi, this spacious suite features views of the sea and the gardens. The bathroom is equipped with high-quality toiletries, hairdryer, bathrobe and slippers. Thissuite has a private balcony, including a seating area. Including a Bang&Olufsen TV, mini-bar with special water menu, and free WiFi, this spacious suite features views of the sea and the gardens. The bathroom is equipped with high-quality toiletries, hairdryer, bathrobe and slippers. This suite has a private balcony and terrace, including a seating area, with views of the sea and the gardens. Including 2 Loewe TVs, mini-bar with special water menu, and free WiFi, this spacious suite features views of the gardens. The bathroom is equipped with high-quality toiletries, hairdryer, bathrobe and slippers. This suite has a private balcony, including a seating area. - Healthy gourmet full board, including water. House Rules Healthouse Las Dunas takes special requests – add in the next step! Healthouse Las Dunas accepts these cards and reserves the right to temporarily hold an amount prior to arrival. Please inform Healthouse Las Dunas of your expected arrival time in advance. You can use the Special Requests box when booking, or contact the property directly using the contact details in your confirmation. All good and even better than we expected. Choices provided in breakfast are limited. We had a very bad problem the water was brown in our room and did not feel clean. The staff offered to move us but that room had the same problem. I cannot think of anything I did not like. It was a perfect stay. Restaurant Although it is good to support healthy food you should also cater for others. Not having suger for tea or coffee is not right, beer not available etc. nice and relaxing beds where extra comfortable and staff very friendly. Gym and spa exceptional, so was the aqua gym instructor great workout. Food is way too healthy and there is only one fix menu with no options. And each menu is 80 Euro which is way too much in terms of value for money. A tiny piece of chicken for example cannot be 80 Euro. Healthy food does not have to be tasteless, badly presented, and no-effort. There is no drink but water and non alcohol cocktails. No sugar and salt in sight. No snacks available. Not even a nice music over dinner. You eat and go to bed. Overall food is bad and probably the most disappointing food I ever had in my life with so much money. You can have drinks ordered to your room but in the grounds you cannot have a drink. There is no effort in anything you eat, there are not even flowers at the tables, music, etc. It is all cold and medical which is very heart breaking given the nice views, pool, etc. You cannot enjoy the view with a drink or a nice wonderful meals. I am a vegetarian, yoga and meditation instructor and I know when I talk about food. They could not really do enjoyable vegetarian food. It seemed vegetarian meant grilled vegetables only. I cook vegetarian food all the time and rarely do grilled vegs and tofu. In this place, I could not even get a salad. I cannot believe I went to Spain, a place there is so much fresh good ingredients, I ran to airport to get a salad. At this time and age, there are so many options and variety of tasty and healthy food, the place is really behind times. Also, the fact that there are no options available on the menu but you are to eat what is set for you and nothing else (and pay 80 Euro) is ridiculous. So if you do not like your food, you are hungry. There is no alternative. 80Euro is an overkill for what is served. I live in Geneva, where food is expensive. Even here, you go for a big meal with wine, you are to pay 60-70 Euro. It is a rip off in Las Dunas when it comes to food. There are two spas.